The first step to cultivating an amazing beard is to use a beard care kit. There are a ton of different varieties, so you’ll need to carefully examine each kit to see what it offers. That’s where we come in! We’ll lay it all out for you, including all of the different pieces of information listed below. When you’re finished there, you can check out the top ten beard care kits that we found during our research. Pieces: How many different components come with the particular kit? This is good to know because it can help you compare each kit’s value. The more the merrier, unless they are products you don’t plan on using. Natural: When a beard care kit comes with products (like balms and oils), this will refer to whether the formulas for those products contain natural ingredients. Some people have much better results using natural ingredients over processed ones. Scented: Whether you want your products scented is a personal preference. If scented products irritate your skin or your nose, consider opting for a product that doesn’t contain any fragrances. We’ll tell you here if the products are scented. Brush/Comb Included: Some kits contain a brush and comb, some contain products, and some contain both. If the kit comes with a brush, comb, or a combination of the two, we will tell you about it here. Conditioner or Oil: Likewise, if a kit comes with some sort of product, including conditioners, oils, or any combination, you’ll be able to find that information here. It’s great to know so you don’t buy any products separately. Box/Bag: Some of the kits on our list come with a box or bag to store or gift your kit in. We’ll let you know if that’s the case here, or if you need to find a gift box separately. With that information under your belt, we can show you our beard care kit reviews. We’ve done all of our research and found the top ten beard care kits on the market right now. Take a look and consider what you need from a kit before you make your decision. Our top pick and budget pick are highlights, so check them out before moving on to the rest of our list. Happy grooming! 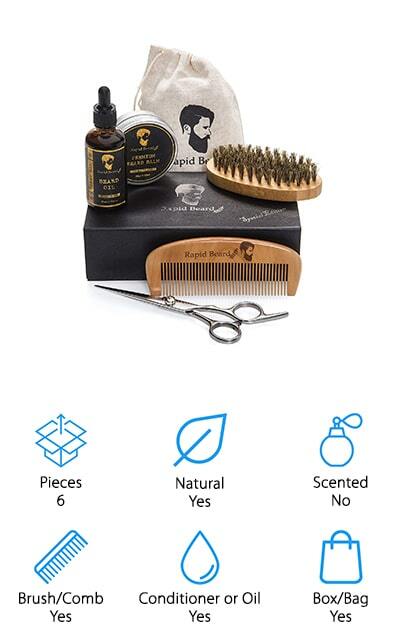 The best beard care kit that we found during our research is this one by Rapid. It comes with quite a few of the essential pieces to keep your beard looking and feeling great. It includes a boar bristle brush to keep all of your beard hairs in line, as well as a wooden comb you can use for on-the-spot beard smoothing. It won’t snag in your hair or leave static behind after grooming. This package comes with a leave-in conditioner as well as a beard balm. Both of these formulas make this an organic beard care kit, packed with essential ingredients with great benefits. They are unscented so they won’t trouble delicate noses. When you use all of these accessories together, you’ll get a beard that looks and feels great, silky smooth and hydrated perfectly. It comes in a gift box, so you can easily turn it into the perfect gift for that special dude. 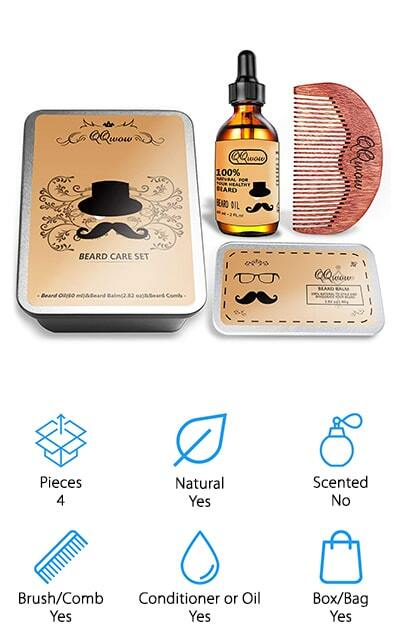 This cheap beard care kit by BEARDCLASS contains no conditioners or oils. Instead, it opts to give you a ton of different combs and brushes to help keep your beard in style with whatever conditioners you prefer to use. It includes a beard brush with reinforced bristles that will contour with your face. This helps to catch each and every hair. The brush is made of wild boar hair and boasts 13 rows of bristles to keep your hair right where you want it: on your face! It comes with a wooden beard comb so you can get all of your hairs straight before brushing it out. 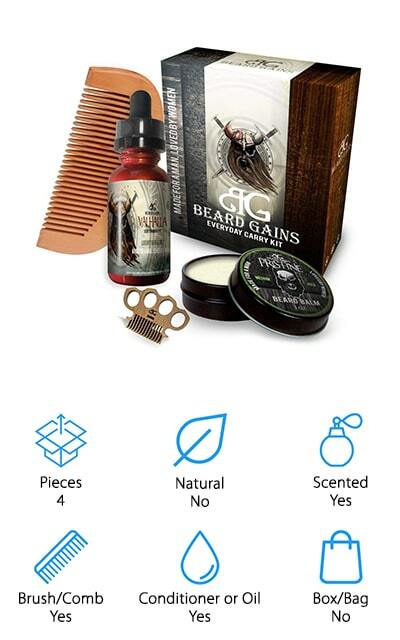 It also comes with a beard and mustache scissors so that you can trim your facial hair down to the proper size, and also eliminate any wild hairs. 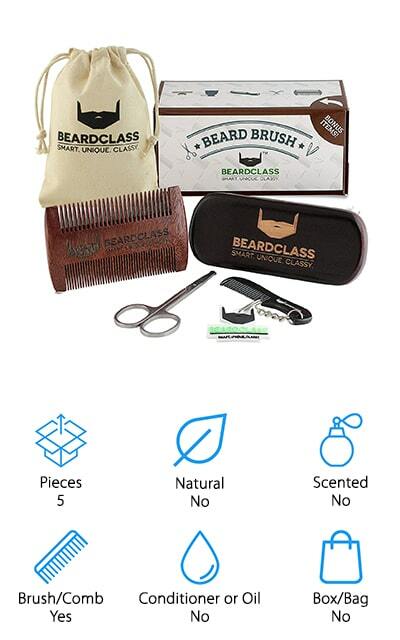 It also comes with a mustache comb specifically for taming your upper lip, and a keychain to show that you love BEARDCLASS! One of the top beard care kits on our list is this one from Bossman. 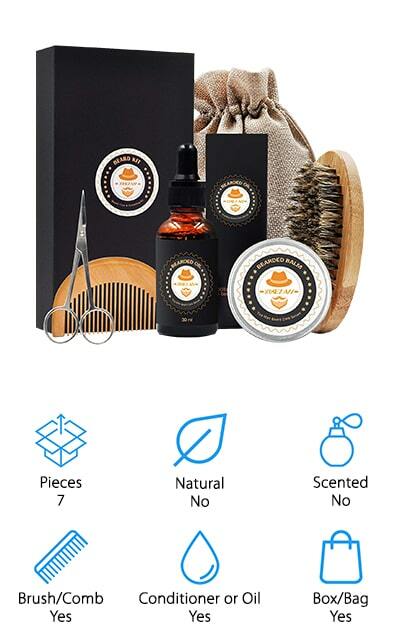 Unlike the previous option, this set gives you a beard oil, conditioner, and balm and opts out of brushes, so that you can use your own favorite tools to style your beard. There is a selection of four different scents to choose from, based on you (or your man’s) preference. They are all based on natural, herbal ingredients, such as sandalwood and frankincense. The conditioner should be used twice a week in the shower to help both your skin in your beard feel moisturized and soft. The beard oil that you apply afterward will keep that moisture in, soften your facial hair and help to eliminate dry and itchy beards. The beard balm goes even a step further and delivers vitamins and minerals to help increase the overall look and feel of your beard in the long term. This kit is pretty amazing! This beard product kit is made by The Manskape Company and contains three different products that will leave your beard feeling great. These include leave-in beard oil that will tame your beard in moments, while also helping to get rid of any dander, restore split ends, and control itchiness that comes from a dry beard. The beard balm included in this set will help to keep your beard moisturized and healthy, while the wash can be used to get your beard clean without stripping away any of the natural oils that you need. Your beard will feel soft and perfectly touchable after use. These three products share your choice of scents. We’re sure that you’re going to love using each product on your beard and experiencing the benefits. All parts are made from farm-grown plants in the USA. The first time you try Wild Willies, you’ll wonder how you ever managed without these amazing products. QQWow makes this elegant beard kit that’s great as a gift! It comes in a beautiful gift box that your bearded friends are going to love. It includes a beard balm that doubles as a leave-in conditioner, an oil, and a heavy-duty comb that all fit beautifully into the gift box. The beard balm is a moisturizing and conditioning balm that you can use to help style and moisturize your beard at the same time. The oil helps to smooth down your beard, which is great when you have longer facial hair. It has deep moisturizing and conditioning properties, which means that even the skin under your beard is going to feel more comfortable and less itchy. The comb is made of sandalwood and helps to smooth your facial hair and reduce tangles and knots. Together, these products will change the look and feel of your beard for the better. The formulas are even organic! 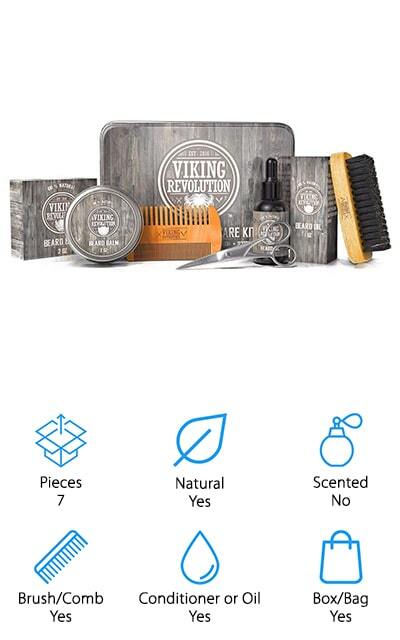 Viking Revolution is a well-known company when it comes to men’s products, and this ultimate beard care kit definitely lives up to the name. All of the products and pieces come with a metal gift box so that you can keep everything together, as well as making it easy to gift. It includes a dual-sided comb as well as a boar hair brush to keep your beard in line. 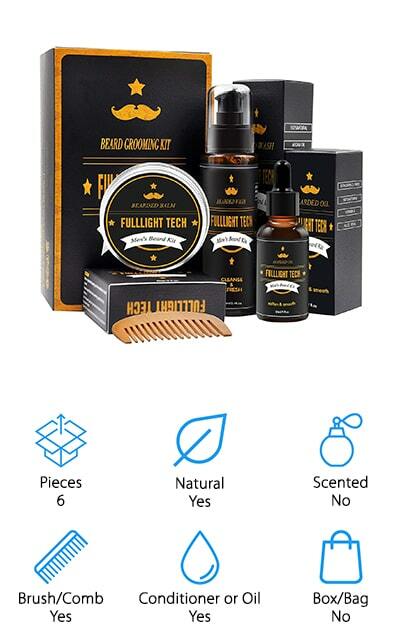 Other products included are an e-Book about beard grooming, scissors for trimming, and beard oil with a convenient dropper. There is a balm as well, and together these products work to keep your beard moisturized and touchably soft. The oil isn’t scented at all, and the balm only carries a light citrus scent from the ingredients. It won’t both even the most sensitive of noses. We love the molded foam inside the box that gives every part of this kit a place for great storage and travel opportunities. Beard Gains makes this complete beard care kit. It’s even more masculine than some of the other beard kits on our list. It’s meant for everyday use so you can get the most out of your facial hair. It includes a beard oil in the Valhalla scent. It’s an orange scent with honey, mint, and cedar notes that smells natural and masculine. The beard balm comes in the original ‘pristine’ scent and is great for keeping your beard moisturized and soft. There are two combs included in this set, a full-sized wood comb and a miniature one for on-the-go. Both combs are sealed with a glossy finish to make sure that they last a long time. The miniature comb has a unique knuckles grip section that you’re sure to love. This kit includes everything you need to make your facial hair look and feel great. You’ll be more confident with the use of these products, too. If you’re looking for a natural beard care kit, this is the one for you. FullLight makes this huge kit that includes a 2oz shampoo, a 2oz balm tin, and a 1oz oil bottle. Plus, it comes with scissors to trim those flyaway hairs, and a quality boar-bristle brush and beard comb. This kit includes everything you need to wash, style, and maintain your beard for the long haul. 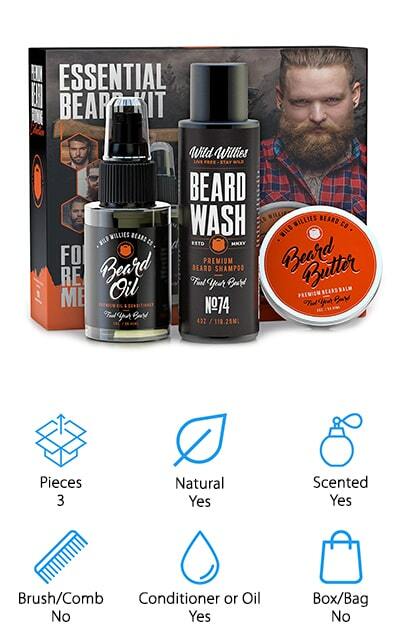 It’s a great gift for someone who is growing a long beard for the first time, as it gives them a uniform kit to work with instead of gathering the parts separately. The wash can be used daily and will help give your beard a great shine while keeping its natural oils intact. The oil and balm both work to keep your facial hair soft and smooth, and they contain no harsh chemicals – it’s all natural! Shape and tame your beard with the comb and brush. 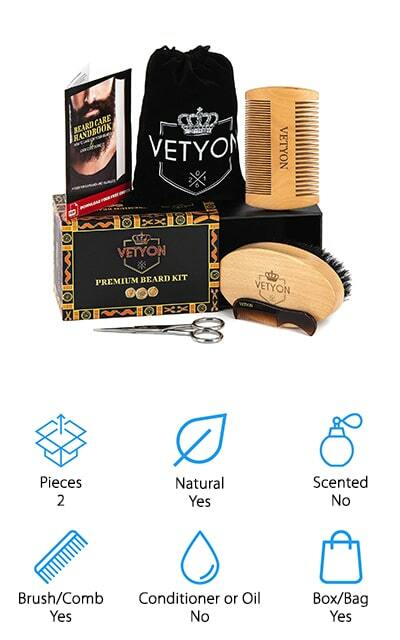 Vetyon makes this men’s beard care kit that includes a brush and comb to help keep your beard looking orderly after you use your own beard wash and conditioner. This set includes a 100% boar bristle brush that’s just stiff enough to grip each beard hair and keep your facial hair perfectly in order. It straightens your beard out when used in conjunction with your favorite products, and has an amazing 10 rows of reinforced bristles. This kit can be used on any type of beard and won’t irritate your skin when you use it! It also includes a solid wood double-sized comb to undo knots and put any disheveled hairs back in place when you’re on the go. This comb is small enough to go right into your pocket when you’re headed out the door. When paired with your favorite beard products, you can create a neat, wonderful look no matter the length of your beard. XIKEZAN’s Beard Kit has a ton of useful components that you or the man in your life will love. 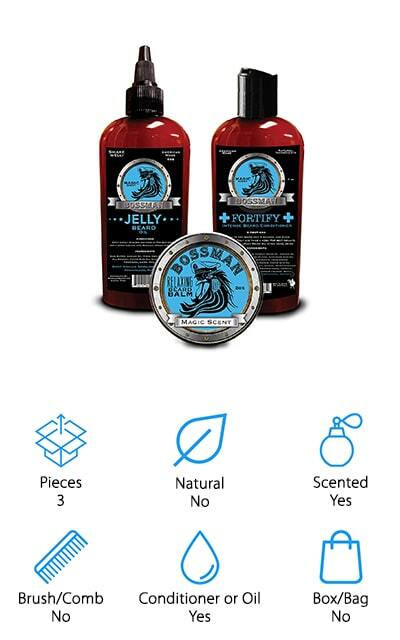 It comes with a beard oil to soften your facial hair and keep your skin hydrated, as well as a signature shaving cream that you can use to keep everything trimmed down and under control. The included balm keeps your beard softer and makes it appear fuller due to the use of beeswax as a main ingredient. The consistency is different, but that works in your favor. Using products from the same company can be beneficial for your beard’s health. This kit comes with an e-Book on grooming, as well as a pair of scissors for trimming away errant hairs. The brush is a hearty boar bristle brush that you can hold in your palm. It can help you exfoliate while the included wooden comb keeps tangles at bay. This kit works together wonderfully for a great-looking beard.